Creepy is a free program for Windows, Mac and Linux that can be used to track Twitter and Flickr users. Track how? Via the geolocation feature that both services make use of. All you need to do is to enter the Flickr or Twitter username in the application and wait until the first longitude and latitude information are retrieved provided they exist. Add the time of posting plus integration of Google Maps, Virtual Maps and Open Street Maps and you have created a movement profile of that user. The tweet and tweet url, or the image title and Flickr link are posted in a box at the bottom of the application for each individual hit. Want to know where Michael Arrington, Techcrunch founder was on January 23? In a building near the San Francisco airport. What did he wear? His urban spoon T-Shirt. Everyone can extract those information with the help of the software. Note: The program is no longer in active development. The author added some new features to previous versions to integrate Instagram and Google Plus. The software stopped working unfortunately and can't be used anymore. Creepy can also search for usernames on Twitter or Flickr. The software needs to be authorized before it can be used to search for Twitter users, the Flickr search on the other hand works right of the box. 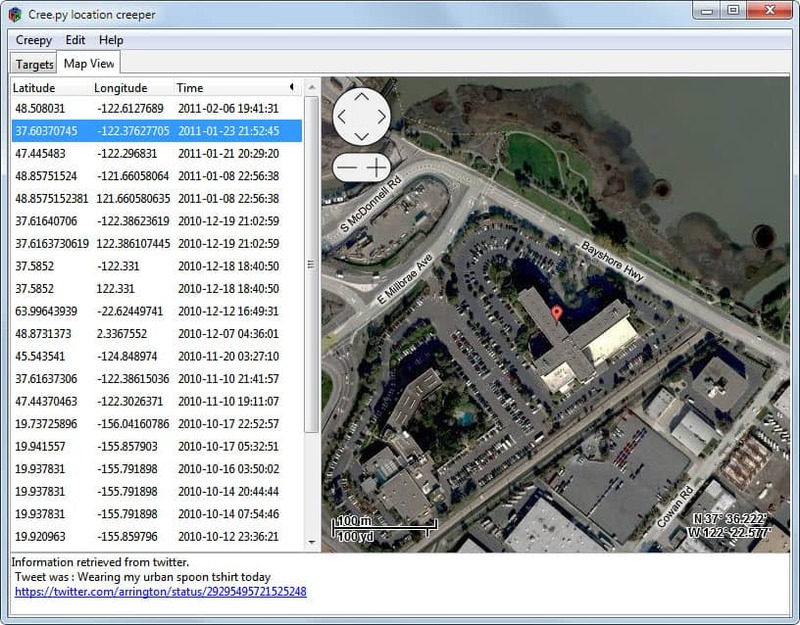 The people tracker extracts the geolocation information from various sources.On Twitter,geolocation information added by mobile device tweets are used as well as the IP address to location lookups if the web interface was used to write a message. For photos, both EXIF tags and geolocation information that is accessible through the image hosting services API is used. Creepy is actually making use of more services, not only Twitter and Flickr. It uses Foursquare as well but only for check-ins currently that are posted on Twitter, and more than a dozen image hosting services including Twitpic, Twitgoo or Img.ly. The service displays the location of the user on Google Maps by default. This can be changed in the options to one of the other available services. The effectiveness of the tracking depends largely on the user's knowingly or unknowingly use of the service's geolocation feature. Is the use of the application legal or ethical? The geolocation data is freely accessibly: all that Creepy does is provide an optimized interface that collects and displays all relevant information directly. Privacy conscious users may want to test Creepy by searching for their own accounts to see if they reveal any information that they do not want to reveal to the public. 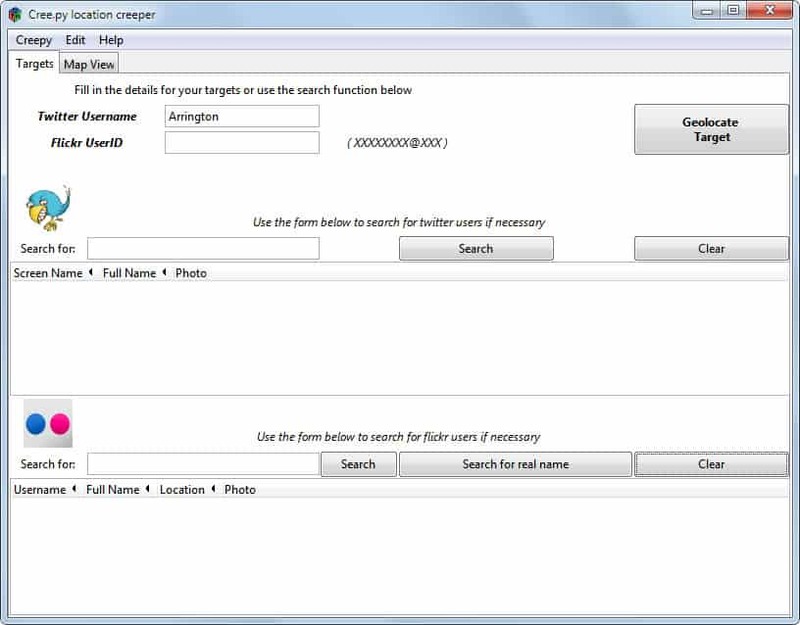 Twitter users can delete all location information that is linked to tweets on the site. Creepy can be downloaded from the developer website for Windows, Linux, or Mac systems. Cool. Now we get to see more celebrity stalking cases. Where we usually hear of one nutcase stalker, now we can see multiple nutcases stalking in the same places. Makes for more interesting news.